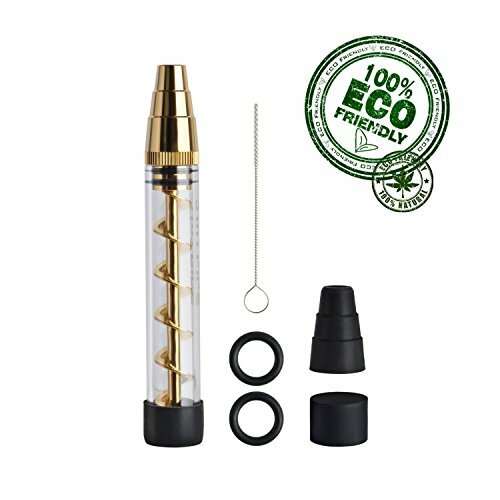 step1:Introducing twisty glass, the glass blunt that easily allows you to pack up to 1.5 grams of dry herbs into the glass tube. step2:After packing the tube, all you need to do is twist the screw counter-clockwise into the tube and light up the end to enjoy. step3:Once you need to ash your herbs, simply twist the screw clockwise so the ash gets pushed out the tube, leaving the fresh herb for your next toke. Unique spiral structure for storing and carrying tobacco. Environmental copper material, safe and healthy, have texture. Three size suction nozzle, fitting the glass smoke gun in the market, realize the smoke filter cooling function.